So some interesting things going on here. Our numbers put Carolina just ahead of the Saints, even though they’re tied. They have both of their games against one another left. 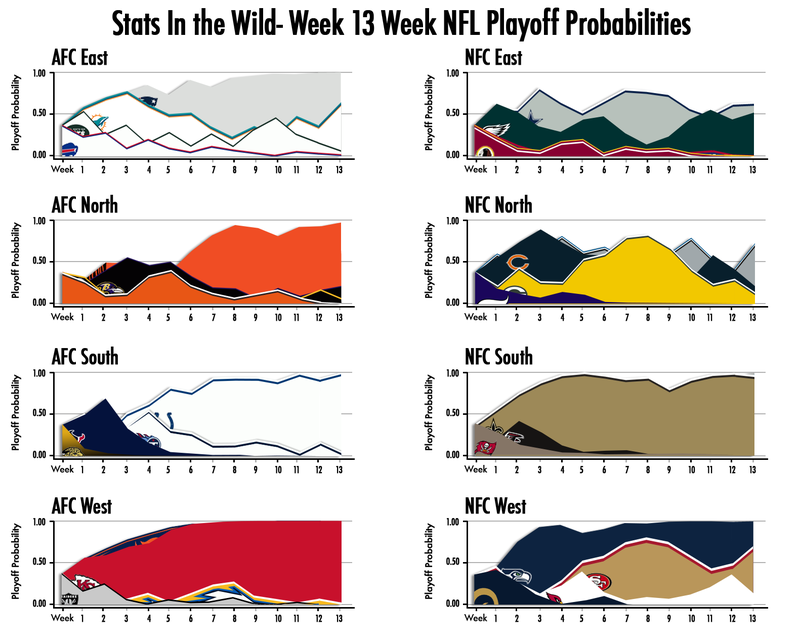 I think, since the other two teams on their respective schedules are bad teams, just different bad teams (Jets and Falcons for the Panthers, Rams and Bucs for the Saints), the difference is attributable to the fact that the Saints have the short week coming off their Monday loss to the Seahawks (not to mention some mechanical issues keeping them in Seattle). It’s a small difference, and not particularly meaningful, since they’re both playoff-bound. Sunday will go some way in figuring out gets which playoff spot. Looks like the NFC North wrapped itself up with the Lions’ big win over the Packers on Thanksgiving coupled with the Bears losing performance against Minnesota. The Niners might have righted their ship, so they’re in good shape as the current 6th seed, while the Cardinals’ brief flirtation with relevance is once again tucked away, as it won’t be needed again util 2014, thank you Philly. Speaking of, the Cowboys and the Eagles kept pace, so week 17 Philly at Dallas could be a pretty big deal, as it is probable the loser of the NFC East will be sitting right at home. Over in the AFC, the Dolphins and Ravens apparently decided they want to play football instead of whatever crap the majority of the AFC has been doing all year. The Titans, Chargers, and Steelers all really plummeted. And the Jets… well they’ve always been terrible, but now I think we can officially call them thusly. The AFC Wild Card #2 all comes down to a footrace between Baltimore and Miami. They both play New England, and as I’ve said before, Bill Belichick is shameless when it comes to meaningless games (fun game, google “Belichick running up score” and count how many articles come up referring to the same game. I stopped at the first page, but literally none of the articles refer to the same incident.) Anyway, the Ravens play the crummy Vikings, plus first place Lions, the first place Bengals. The Dolphins, on the other hand, play the essentially finished Steelers (though they have a shot and doubtlessly will not forfeit the game, you can take that prediction to Vegas), plus the last place Bills and the blight-upon-humanity known as the Jets. So I’d say the schedule favors the Dolphins by a good amount. Posted on December 6, 2013, in Uncategorized. Bookmark the permalink. 1 Comment.